As shown in Figure 1, the Security Server is a daemon running in the operating system that provides a trusted implementation of various security protocols, including authorization computation. 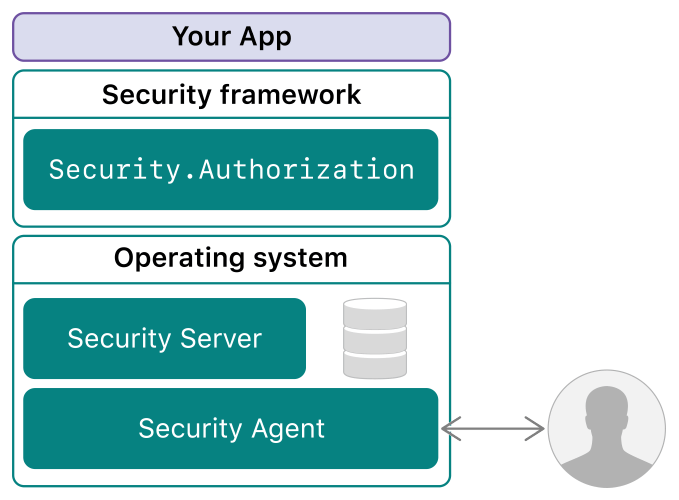 In turn, the Security Server relies on the Security Agent to interface with users when authentication is needed. Thus an app can verify credentials (usernames and passwords) without ever accessing them directly. This authorization process also allows the means of authentication to change in the future (such as adding Touch ID) without your having to modify your app. For a simplified, class-based version of this API, consider using the SFAuthorization class instead. When you need a user interface that enables display and control of the current authorization state for a particular set of rights, use the SFAuthorizationView class. The Authorization Services API is not supported within an App Sandbox because the API allows privilege escalation. Use authorization items (alone or in sets) to represent rights and environment information. A structure containing information about an authorization right or the authorization environment. A structure containing a set of authorization items. An authorization item set designated to represent a set of rights. An authorization item set designated to hold environment information relevant to authorization decisions. Use name tags to define authorization security items. Frees the memory associated with a set of authorization items.